Formal or funny...Raise your glasses please! 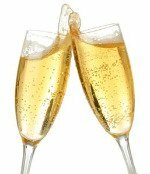 A toast is a great way to focus attention on the birthday boy or girl and allows everyone to wish them all the best. General Birthday Toasts ~Raise your glass to celebrate. Let us this moment seize. 'Time is a companion that goes with us on a journey. It reminds us to cherish each moment, because it will never come again. ~ Well what a woman she is and its clear that women are superior. Look at Ginger Rogers. She did everything Fred Astaire did.